Urban Planning has a long, rich history in the Queen City. You can date this back to the influential and charismatic individual named Ladislas Segoe (1894-1983). Segoe was involved in nearly all types of professional planning...advocating for an increased presence of private planners and even operating his own successful private practice: Ladislas Segoe and Associates of Cincinnati, Ohio. Needless to say Segoe was extremely influential in the great deal of planning that took place, in Cincinnati, in the early 20th Century. During the early 20th Century you saw a lot of firsts for the planning profession...especially in Cincinnati. In 1923 ground was broken on the planned community of Mariemont; planned by John Nolan the community boasted many concepts (small blocks, mixed uses, mixed owner/rental units) that are now the foundation of what is considered new urbanism. Shortly thereafter, in 1925, Cincinnati was recognized as being the first major American city to endorse a comprehensive plan. This plan was revolutionary for American cities and was primarily drafted by Ladislas Segoe and Alfred Bettman. 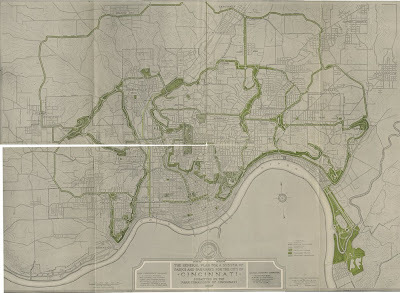 This plan outlined park corridors throughout the city, systems of grand boulevards, complimented the Park Plan of 1907, and included the now requisite transportation component of modern comprehensive plans. Ten years later in 1935 the Resettlement Administration, established under the Roosevelt administration, set forth to build three 'Greenbelt towns.' One of those 'Greenbelt towns' being Greenhills in Cincinnati. These towns became the case studies for future planned communities like Columbia, MD and Reston, VA. Shortly thereafter, in 1941, Ladislas Segoe publishes the first of his "Green Book" series entitled: Local Planning Administration. After this frenzy of breakthrough planning activity, taking place in Cincinnati, you have to fast forward to the very recent history. In 2002, Charlie Luken and City Manager Valerie Lemmie were under extreme pressure to make budget cuts...and not surprisingly, Valerie Lemmie pushed to have the Planning Department abolished from the Cincinnati government structure. Combine this with the idea that this move would make the City more 'developer friendly' and you have an abolished Planning Department. The move didn't necessarily have the desired impact and has actually hampered the City's efforts to update it's comprehensive plan, and perform long-range planning that is essential for any community. Five years have past and Mayor Mark Mallory is living up to his promise of re-establishing the Planning Department in Cincinnati. Charles C. Graves III was hired as the director of the re-established department and will start his job on September 4th. Hopefully with the support of the Mayor, City Manager and City Council Cincinnati can return to it's proud ways of being a progressive area for professional Planning. There is a lot to catch up on first and foremost, but the progressive minds in professional Planning at least have a place to gather again in Cincinnati government. One can only pray that Mr. Graves is not the usual D.C. employee. It seems odd to me that we hire someone from the city that Washington Monthly, a superb liberal journal, called for many years the worst governed city in the nation. I have spend many hours browsing the old city plans. I found the priorities for Over the Rhine particularly interesting. Where did you get your 1907 image. Do you care if I put it on Wikipedia? I believe I scanned it from a book I have.